THE FIRST DAY at a new job is pretty much like your first day at school: Exciting and utterly terrifying at the same time. We’ve all been there and know that it’s a bit of an emotional rollercoaster ride at the best of times but, as Ronan Keating once said, you’ve just gotta ride it. 1. Being incredibly excited that you got the job. Money? Career Opportunities? Who cares what’s more important – you’re in! Oh God. You got it. Now you have to actually do all those things you claimed you could do in the interview. There go all your plans to show up looking flawless and alert on the first day. 4. 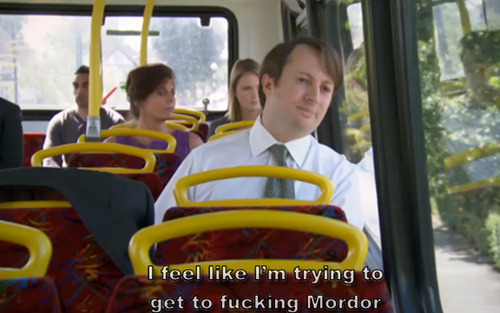 Having nothing but contempt for your fellow commuters. If those kids just walked to school and those lazy drivers left their cars at home you wouldn’t be biting your nails for fear of being late thanks to unnaturally bad traffic. And don’t even mention those buses and trains and their ‘real time information’. It was 5 minutes away 50 minutes ago. 5. Wondering what on earth you’ve let yourself in for. This sounded far less complicated when you read the job description. There’s actually no way you’ll be able to remember and/or do all this. No way. Never. You should just go home right now. 6. Discovering that your life is in fact Mean Girls. If you don’t know anyone well enough to tag along at lunch or can’t cope with the idea of trying to start conversation in the canteen, you may genuinely consider eating in the loo. 7. Looking for comfort from Facebook/your phone when nobody’s watching. Let’s face it. all you want to do at this stage is remind yourself that you do actually have friends who think you’re the best at everything. 9. Reassessing your life after Day 1. Remember when you were in secondary school and realised you couldn’t get away with things any more because the ‘I’m a first year’ excuse was gone? That’s you on Day 2. 11. Making your first mistake and attempting to keep it a secret. MUST. FIX. BEFORE. BOSS. SEES. 12. Actually getting the hang of it. Sure, now you’re suckin diesel. 13. Becoming part of the furniture. You’ve made ‘friends’ with your colleagues and even been invited to after work ‘socials’. Sure, you’ve been there a week, you’re practically one of the old crowd now. 14. Feeling just a tad smug when the next deer in the headlights arrives, looking just as frightened and clueless as you did. And the circle of life is complete. Email “All the stages you go through when starting a new job”. Feedback on “All the stages you go through when starting a new job”.